Cindy Sherman be danged, the best book of self-portraits is Lee Friedlander's. Although not much talked about any more—old guys can't be edgy—I have to admit that I get more from Friedlander than from any other photographer (although even people who dig him completely still hate some of his pictures). I've made the case in the past for Friedlander being the most significant photographer of the second half of the 20th century, and people think I'm being didactic and provocative (certainly an understandable suspicion!). Not so—I mean it completely sincerely. If I were to rank photographers based on the number of the world's most interesting pictures they've made, Friedlander would be so far out front that the only competition would be for far-distant second place. The only thing he can't find ironic is jazz. I mean, this is a guy who went to Canyon de Chelly and (probably wandering amongst all the VC photographers searching for the tripod-holes of O'Sullivan et al.) made a picture of his own gawky shadow with pubic hair! Jeez. I've been looking at this picture for twenty years, and like many of my favorite Friedlanders I could look at it for the rest of my life. In fact, I'm sure I will. Do you have a book that you particularly recommend? Seems to me that he publishes too many "not quite good enough" images. No, actually I don't recommend his books. He's quite frustrating for some people and if you don't like him, I see no harm in just leaving well enough alone. This "shadow list" is just a vent for some of my own personal favorites. I hate to seem shallow and uninformed Mike, but I confess I don't "get it" about that image. What's to get? This is a list of his personal favourites, that's all it is. In case you missed it for some strange reason, well informed as you are, Friedlander was awarded by Hasselblad last year. They certainly agree with you! "I've made the case in the past for Friedlander being the most significant photographer of the second half of the 20th century"
I am sadly undereducated about photographers (considering my interest in the art form), but from what I know of, I agree with you. His "Sticks And Stones: Architectural America" for example is wunderbar. And I blogged him a couple days ago. Now how about André Kertész as the apex of the first half of the 20th? Steve, what's to get? It's a picture of a guy in a pickup truck. 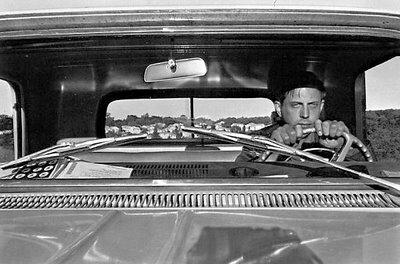 There's the shadow of a Leica on the hood, a Mobil roadmap on the dash, and houses on a hillside out the rearview mirror. It all works for me, but I don't think there's any trick to it. don't forget the windshield wipers! There is more life in his images that most people give credit, they sorta sneak up on you visually. I agree with your glowing assessment of Friedlander's work. I love the Eggleston and Shore color stuff, but for monochrome, this is it. If one is interested, there is a new book of his, a comprehensive work that is both enormous and yellow. Look for it on Amazon. Friedlander has created some amazing images over the years and very difficult to choose just one or two favourites. I particularly like his work in the book Factory Valleys. Or you could go Madonna (apparently a singer of sorts now) spotting in his book Nudes. Mikes choice is an exceptional image, so intense. 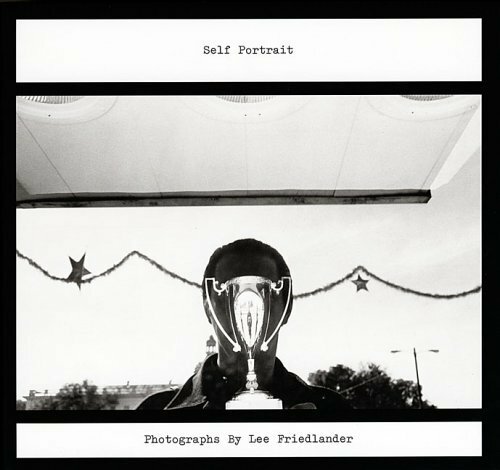 His retrospective book Friedlander is selling for an amazing £30 on Amazon and like many of his books it’s beautifully printed, a real bargain. I second Eolake. How, indeed, about a wee post on Kertész :P? I find it difficult to think of another photographer who could shoot so many different types of photos (street, rural, portraits, nudes, still-life, distortions, abstract, blah blah blah) yet all with such perceptiveness, humour and influence. And may I add that while I love both your lists, the shadow list is turning out to be the real eye-opener. This is not about Friedlander, but it`s about a photograph I can´t get tired of looking at, it´s the one on the cover of the Imperical Photographer, I suppose it´s a Mike Johnston, everytime I look at it something new appears, Mike, is it possible you would like to sell me a print? No trick to it you say? Take a picture of yourself sittin' in yer pickup headin' out toward the sun and then bank it for forty years. Let me know if it turns out as good as this one. The shot is a feast for anyone with an appetite and a spare roughguide to the sixties. The shot is wonderfully cinematic and ripe for a multitude of captions written by the initiated.